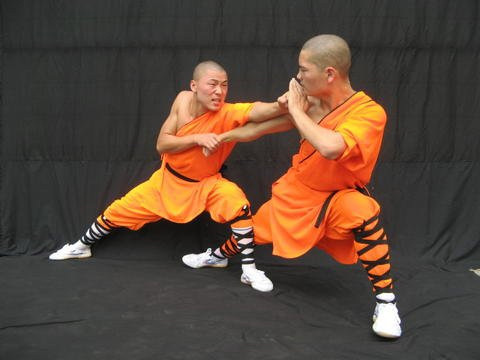 Shaolin Kungfu refers to a collection of Chinese martial arts that claim affiliation with the Shaolin Monastery. Of the tens of thousands of kung fu wushu styles, several hundred might have some relationship to Shaolin; however, aside from a few very well known systems, such as Xiao Hong Quan, the Da Hong Quan, Yin Shou Gun, Damo Sword, etc., it would be almost impossible to establish a verifiable connection to the Temple for any one particular art. Those who practice Shaolinquan leap about with strength and force; people not proficient at this kind of training soon lose their breath and are exhausted. Taijiquan is unlike this. Strive for quiescence of body, mind and intention. In 1784 the Boxing Classic: Essential Boxing Methods made the earliest extant reference to the Shaolin Monastery as Chinese boxing's place of origin. Again, this is a misconception, as Chinese martial arts pre-date the construction of the Shaolin Temple by at least several hundred years. According to the Jingde of the Lamp, after Bodhidharma, a Buddhist monk from Kerala in South India, left the court of the Liang emperor Wu in 527, he eventually found himself at the Shaolin Monastery, where he “faced a wall for nine years, not speaking for the entire time”. According to the Yì Jīn Jīng,after Bodhidharma faced the wall for nine years at Shaolin temple and made a hole with his stare, he left behind an iron chest. When the monks opened this chest they found two books: the “Marrow Cleansing Classic,”and the “Muscle Tendon Change Classic”, or "Yi Jin Jing" within. The first book was taken by Bodhidharma's disciple Huike, and disappeared; as for the second, the monks selfishly coveted it, practicing the skills therein, falling into heterodox ways, and losing the correct purpose of cultivating the Real. The Shaolin monks have made some fame for themselves through their fighting skill; this is all due to their possession of this manuscript.